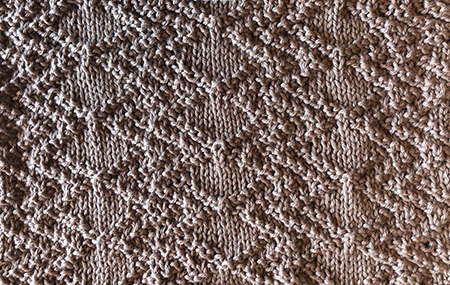 One of the most striking knit and purl patterns I found in The Knitted Lace Pattern Book, was stitch number 31, with offset diamonds and vertical zig-zagging lines of reverse stocking stitch. Even though this pattern was published in 1870, I think it has a real 1930’s vibe to it, and would make a great sleeveless pullover for a man or a woman, or a really nice scarf. I can also imagine separating the vertical lines of diamonds with a cable stitch, or even working a lace diamond inside each diamond shape. Whatever you decide to use this stitch for, I hope you have fun with Stitch Number 31 from The Knitted Lace Pattern Book, aka Offset Diamonds. I’ve updated it into modern knitting terms, created a chart and test knit it so it can become a favourite of knitters worldwide once more.